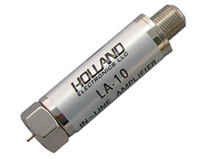 The LA-10 is a full band (5-900 MHz) CATV, UHF/VHF Line Amplifier with medium output capability. Note: If you need to Add a couple of HD Ready TV sets to your TV Antenna Hook-up, this amp will do fine to Offset the Loss encountered when adding a Splitter To feed the additional Outlets. It is Forward only (54-900 MHz), which matches the Bandwidth of any TV Antenna System, but will not pass return from High Speed Internet Modems or Pay Per View Converter Boxes associat3ed with Cable TV signals. We have Amplifiers that will do that. See Below! Check Your Picture quality where the Cable TV feed enters your Home, if it's good there, you can replace connectors, cable and Splitter to bring your installation up to the newest specifications. If you are feeding numerous TV sets or long Distances, use this Amplifier before the Splitter Or long cable run to maintain Signal Quality.